Hello, I really appreciate all the work you put into creating a Hungarian course. However, I feel like it is not for beginners. I practice every day, and very often I take training lessons to practice some things I learned before. I find them to be very difficult, not the same level as regular lessons. Maybe you should put easier and simpler sentences in the beginning? I find it difficult to create complex sentences while i haven't learn correct grammar which stands behind it. I learned portuguese, which I was a total beginner at, just like hungarian, but it was more consistent and i had no such problems. Thank you and keep up the good work! "I speak Hungarian, what's your superpower?" I agree that this course loves its unusually long and weird sentences and ruminating about the grammar a bit too much. Haha yes :D This is the one insane sentence that tests your dedication to the course and strengthens your love for Crtl+C Ctrl+V. I didn't even seriously try to translate this one from Hungarian to English because I knew there would be some kind of glitch somewhere. There are so many long sentences on this course! I know I need practice listening but I already have to listen to even a short sentences 3-5 times to hear it so when I get something like this there is basically no hope. The most annoying thing is it makes the timed practice basically impossible. 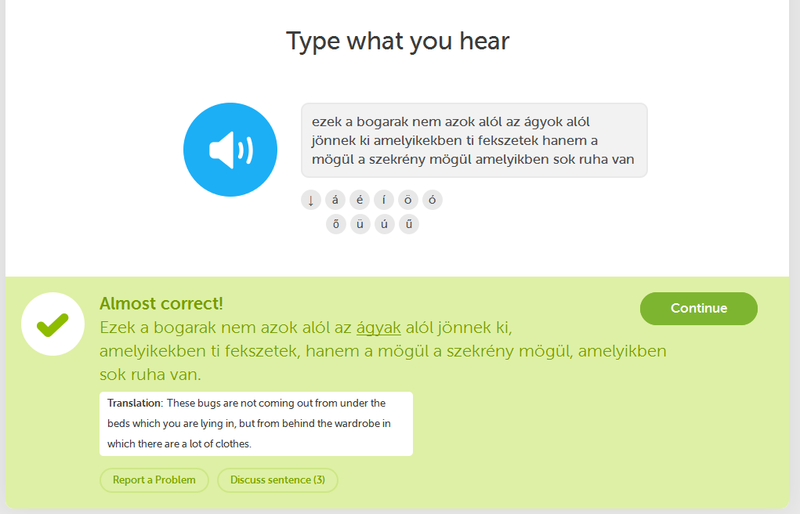 Keep practicing...I too am new at this course even though I have spoken Hungarian since a child. Many words I never heard before, different dialect maybe but I find it still challenging. Thank you all for your support. I wont give up. One more thing i would like to be improved, when practicing on my phone, not many words are translated when clicked on so it prolongs my practice since i need to write something incorrect to get the correct answer, if you know what i mean. I have always wanted to learn Hungarian (the language of my paternal grandparents). I tried a different online course a few years back but got very frustrated. Duolingo has been awesome! I write down all the new words because that's how I learn. I'm getting used to the weird syntax and pronunciation. The hardest thing is still sometimes trying to hear the words. Thank you for helping me fulfill a lifelong dream! Directional postpositions was too hard, the following lessons too easy, and full of errors.